The Yahara may sound like the name of a vast desert, but it’s actually a 359-square mile watershed in southern Wisconsin. 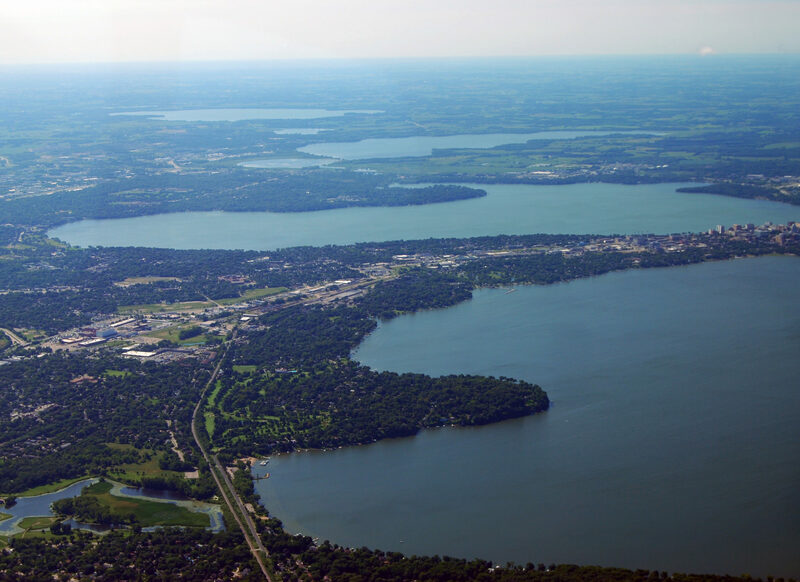 The Yahara Watershed is a mix of urbanized land (including the state capital), productive agriculture land, and a chain of lakes called the Yahara Lakes. Because of its diverse environment, the Yahara provides many natural benefits, or ecosystem services, to people and nature. Aerial view of the chain lakes and human-nature interaction in the Yahara Watershed, Wisconsin. Ecosystem services are connected in complex ways that we’re still trying to understand. Some have synergistic relationships in which the increase of one ecosystem service leads to the increase of another, such as soil nutrient retention and food production. Other relationships can be tradeoffs—as when one ecosystem service, such as crop production, increases and it leads to unintentional declines in other ecosystem services, such as water quality. Understanding the relationships between ecosystem services can help to predict how ecosystem services may change in the future. To better understand the relationships between ecosystem services, a group of LTER researchers with the North Temperate Lakes LTER site (NTL-LTER) evaluated eight food, water, and biogeochemical ecosystem services in the Yahara watershed. Their project, Yahara 2070, studied how the relationship between the eight ecosystem services might change across various spatial regions from 2001 to 2070 based on four scenarios with varying social, political, economic, and environmental conditions. In their study, the relationships between various ecosystem showed different patterns over time. Some relationships exhibited high interannual variations (e.g. drainage vs. food production, nitrate leaching vs. net ecosystem exchange) and even reversed signs over time (e.g. perennial grass production vs. phosphorus yield). The researchers also noticed that some relationships stayed constant regardless of spatial scale, while other relationships were inconsistent from small to large scales. Their results showed that local tradeoffs between food production and water quality do not necessarily scale up, so reducing local tradeoffs may be insufficient to mitigate such tradeoffs at the watershed scale. This study is helping managers of the Yahara Watershed explore the potential long-term impacts of management decisions on ecosystem services. Outcomes from this research will help managers in this region as well as other urban-agricultural watersheds to understand the environmental and socio-economic mechanisms that drive changes in ecosystem service relationships, and how to balance the need for critical services such as water quality and food production.